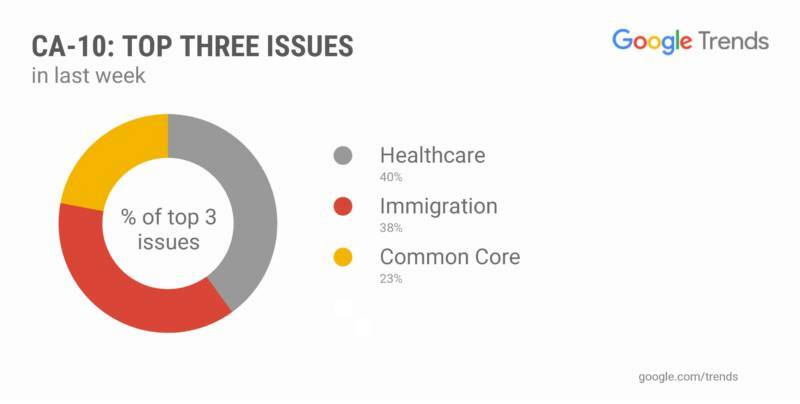 Searches from California's most competitive swing districts are reflecting an outsize interest in health care issues, according to search data from Google Trends. In nearly all of the seven districts rated "Lean" or "Toss Up" by the Cook Political Report, election searches around health care issues outnumbered interest in issues like immigration or the economy. 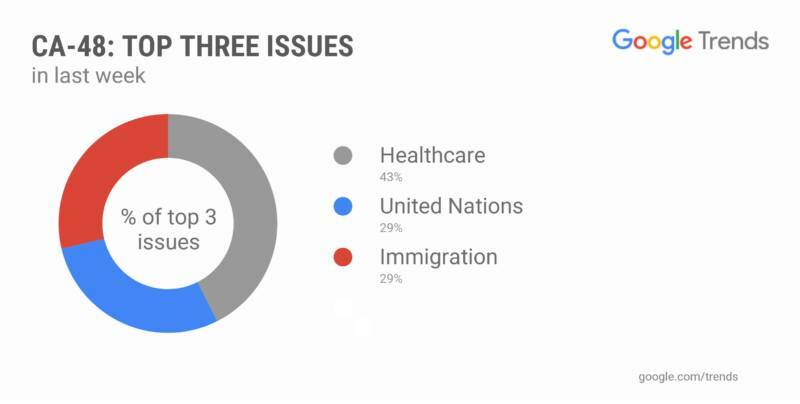 "We've seen health care become the biggest issue in search for a number of months," said Simon Rogers, data editor for Google's News Lab. "Really since the beginning of this year, it's certainly grown to dominate political searches." The one exception was in the 25th District, north of Los Angeles. There, searches around minimum wage have outpaced health care searches so far this year, but in recent weeks, interest in health care has risen to the top of the Trends list. The Trends data was custom-built for KQED by Google to focus on congressional districts. California's battleground House seats will help decide the balance of Congress in the November election. The charts below show search data for the week ending Oct. 6. California's 10th District includes Stanislaus County and portions of San Joaquin County. It is currently represented by Republican Jeff Denham, who is being challenged by Democrat Josh Harder. California's 25th District includes part of northern Los Angeles County and part of Ventura County. It is currently represented by Republican Steve Knight, who is being challenged by Democrat Katie Hill. California's 39th District includes parts of Los Angeles, Orange and San Bernardino counties. It is currently represented by Republican Ed Royce who is not running for re-election. Republican Young Kim and Democrat Gil Cisneros are running to replace Royce. California's 45th District is based in Orange County. It is currently represented by Republican Mimi Walters, who is being challenged by Democrat Katie Porter. California's 48th District is based in Orange County. It is currently represented by Republican Dana Rohrabacher, who is being challenged by Democrat Harley Rouda. California's 49th District includes parts of San Diego and Orange counties. It is currently represented by Republican Darrell Issa, who is not running for re-election. Republican Diane Harkey and Democrat Mike Levin are running to replace Issa. California's 50th District includes parts of Riverside and San Diego counties. It is currently represented by Republican Duncan Hunter, who is being challenged by Democrat Ammar Campa-Najjar. Google Trends identifies topics within the company's search data, anonymizes it, and tracks changes in real time. Rogers said the tool is able to identify when a search around health care is referring to a political topic as opposed to a medical inquiry. "This isn't somebody searching for a cold or they have a runny nose and they want to find out what's wrong with them," he said. "It's people searching for health care as a political issue." 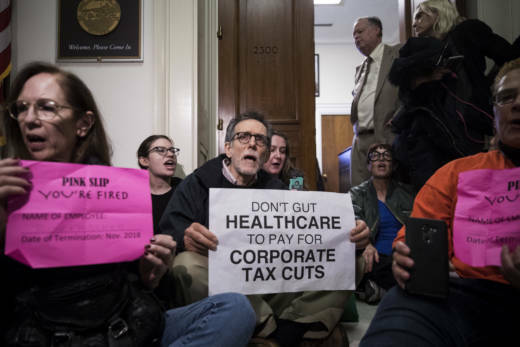 The interest in health care would seem to bolster the Democratic party's focus on the issue in their congressional campaigns. But the data is only a reflection of searches made in the district—and even then does not reflect what people are searching about health care. For Democrats hoping to flip these seats, the challenge remains to convince voters of their vision on the issues, and to turn interest into registration and votes.